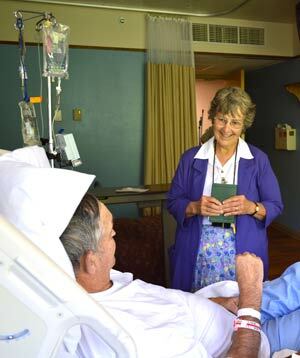 Sister Rita Plante, a canonical Sister of St. Joseph, ministers as a volunteer hospital chaplain in Silver City, N.M.
We invite you to consider joining us in our mission as Sisters of St. Joseph, in one of our two forms of membership. An agrégée — pronounced ah-gre-ZHEY — did not make vows of poverty, chastity and obedience, but she lived according to the rules of the Sisters of St. Joseph through a vow of stability, and was recognized by the local people and the local churches as a Sister of St. Joseph. In the past decades, the modern Sisters of St. Joseph of Concordia studied our origins and our original spirituality, and have revived that early practice based on what we learned. The Senate of the Concordia congregation approved agrégée membership in 2006. The congregation welcomes Sisters Jan McCormick and Sharon Hayes, both agrégée sisters, into the community after they professed their vows in June 2011. This opens up our charism to people who might not have given thought to the traditional form of religious life. Candidacy into the community begins with a two and a half to three and a half year process during which the candidate studies, prays and discerns whether or not she is called to this life. She spends the first year and a half discerning to what kind of membership she is called: canonical membership for which she professes the three vows of poverty, chastity and obedience; or, agrégée membership for which she professes the one vow of fidelity. Canonically vowed sisters profess the vows of poverty, chastity and obedience, as defined by canon — or church — law. As part of the vow of poverty, an individual sister relinquishes all personal wealth and income; at the same time, the congregation assumes responsibility for her economic well being for the rest of her life. 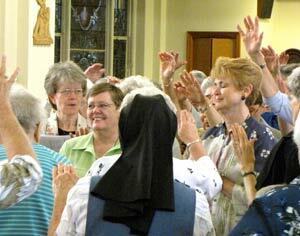 Canonically vowed sisters begin their religious life with a formal novitiate. During their novitiate, they have left their previous life, but haven’t yet taken up their works as a Sister of St. Joseph. Once they have professed their vows, they can be commissioned to a specific work that is needed by the community. Agrégée sisters profess a vow of fidelity to the congregation, but it is noncanonical, meaning that it is not governed by Church law and is instead a private vow between that sister and the Concordia congregation and is governed by policies. It also means that the agrégée does not relinquish her finances to the congregation, and the congregation assumes no financial responsibility for her. Agrégées do not leave behind their outside lives. Instead, they meet with mentors and study around their regular work and life schedules. Once they have professed their vow, they continue in their work and life schedule and participate in the ordinary gatherings and committee work of the community. For a fuller explanation of canonical and agrégée membership, CLICK HERE. Contact one of our vocations team members: Sister Dian Hall at dianhall5@yahoo.com, Sister Lorren Harbin at lharbin@csjkansas.org or Sister Pat Eichner at eichnerpat@csjkansas.org.